Team Hallowoosh reviewed this attraction on October 13, 2016. 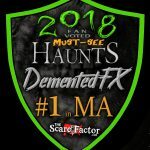 I’m just going to flat out say it, DementedFX is easily one of the top three best haunted houses in New England. When you eventually make it out of the exit (if you make it), you will be screaming about how awesome everything is. You know that feeling you get at a rock concert when the band goes out playing their best song and the whole stage explodes with pyro and it’s the only thing you can think about for the next week? Yeah, it’s like that. DementedFX held the grounds for two years at the old Button building in Easthampton and now they’ve moved to the old mill buildings in Holyoke at the corner of Adams and Main. The location provides the haunt with an additional 7,000 square feet. If you thought the last haunt was short then I have two things to tell you; 1: You got your standards set a little high there buddy. 2: This place is so big now you’ll think the thing is over more than once, but it’s only just getting started. Driven by the desire to become one of the best attractions in the country, these guys are out for blood doing everything they can to get to the top. The very first actor you will meet is via television monitor. The professor claims to have a cure for an apparent outbreak and he needs you to go get it. 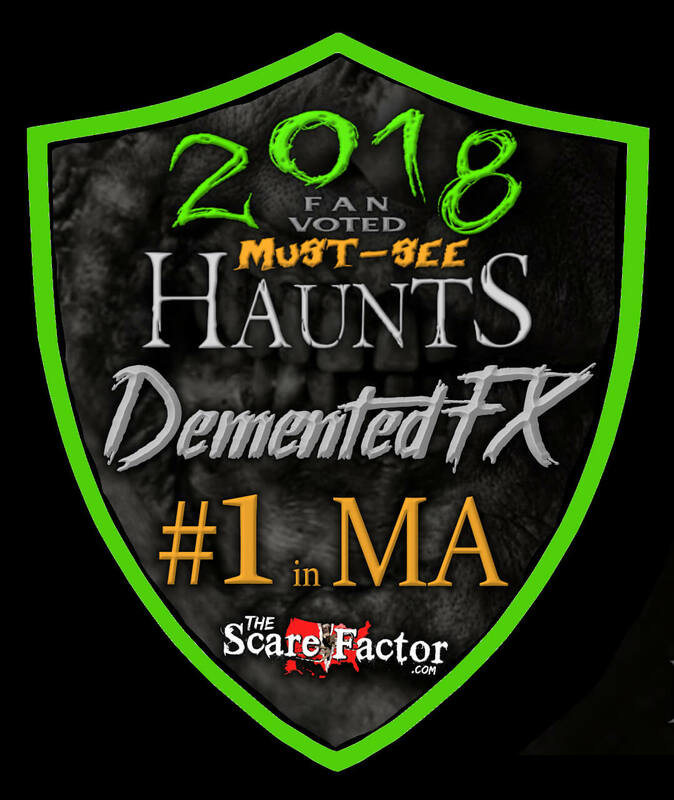 Before you descend into the chaos that is DementedFX haunted house, you will encounter a few raging, violent doctors trapped behind glass panels banging to get out, so move quickly. The majority of the haunt is filled with doctors and scientists lashing out at you. The military personnel were not as present as I remember it being in the past. You will encounter soldiers who will try to rescue you; but, for a bigger space, I wasn’t expecting less than before. The rest of the actors, other than the professor himself, were a bit on the typical side when it came to haunt acting. I loved how the show had a nice mix of scientists yelling for help or turning into a monster or being a monster along with soldiers as well in the old location. This year was pretty much full, jump-out actors and in-your-face grunting. I could say that a Thursday night was not the best choice to visit, but we pay the same ticket price as any other night. The actors did, however, hit their marks with the right timing and never jumped back to their spots too quickly. Given the fact that DementedFX is centralized on the lab-experiment-gone-wrong theme, you will see one too many lab coats. If it were not for the amazing sets and props, the overuse of the white lab coat over black clothing would become very boring. I can say the same about the makeup. While I appreciate and respect the effort to ditch masks and make the story more realistic, the makeup job wasn’t a huge help. Another thing I loved about the haunt in the past was this clear drive to put the clinging-for-life actors in the beginning and worked it’s way up to the completely mutated actors at the end. I cannot recall any characters in any real stage of a mutation. Although, it seems this year’s storyline may be going more “zombie apocalypse” and less “genetic lab accident,” it would have still been nice to see some of those great, face-peeling effects I loved. One of the biggest reasons why DementedFX moved to Holyoke was to accommodate more people without sacrificing the timing of groups. It is true that the indoor waiting line is bigger, but the amount of guests this place will attract is still going to have plenty of people waiting in the street for a while. Once inside, right after you purchase your ticket, you will find a nice-sized bar with different beers to choose from. On certain nights, a food truck will be available on the main street. The indoor waiting line is shadowed by a colossal projector with speakers playing music videos. I do wish the music choice would have stayed with heavy metal or at least rock n’ roll to get me in the mood, but I did have to stand through a few hip hop songs. You will be patted down for weapons or drugs before entering the building. Put those all together and you don’t have a waiting line; you’ve just made Holyoke’s newest nightclub, Las Dementia Feux or something similar to that. The area itself could be enough to keep some customers second guessing about going. It is no secret to the locals that Holyoke has had its share of crime. The fact that there is no real parking lot and you will have to find a spot on the side of the street for the night doesn’t help. Needless to say I can expect Uber drivers to become quite familiar with the place. Others, and I myself, would have been happier with a more comfortable location; but, once I went through the attraction, all was forgiven. When you approach the building you will notice that half of the brick structure is covered in green ivy. Installed directly into that ivy are the words “Haunted House” in big red letters. Inside with the bar and the loud music in the waiting line, it is a little difficult to get into haunted house spirit. Maybe I just prefer these things to be sinister, but I can see how death metal music videos could send people running out the door. The fun begins in the very first room with a normally-dressed staff member going over the rules of the attraction. The fun part is walking from a dark, club-style room with speakers shouting in your face for a while then into a small, fluorescent-lit, white room that is almost soundproof. Almost like the spirit of the place shuts that door and says “alright, playtime is over, this is serious.” In that respect, DementedFX is one of the few haunts where you can’t make out anything about what you are about to walk into and they force you to not think about it. This was actually a really cool concept. Before I go further, I have to mention their “No Clowns” policy. With all the crazy clown sightings all over the country making people very disturbed and uneasy, DementedFX is very proud to announce that their attraction will have no clowns, except maybe for the big clown face crossed out painted on the walls in the waiting area. The first few rooms really do make you believe you are in a top-secret science lab. The walls are bright white and clean just like they would be. Their elevator has always been a classic room with retina-detection scanner and sophisticated letters and numbers to really make you believe this is something entirely different from your regular, dirty haunted house. Once I was in the real haunted house, there was absolutely no mistaking the danger I was in. All I could hear were the screams, sirens and roars of the monsters that may be ahead waiting for me. Spoiler Alert! Monsters is a nice way of putting it. I wouldn’t go as far to say the haunt relies on special effects. A more appropriate way to phrase it would be “OH MY GOD THAT WAS AMAZING!” LaPointe and Spear have worked incredibly hard and are masters at creating monsters. You will encounter multiple creatures in DementedFX with each one being more demented than the last. LaPointe was telling me that, the day after they closed the 2015 season, they started packing up and moving their haunt from Easthampton to Holyoke. It has been a non-stop transition until opening night of this year. Somewhere they managed to find the time to create a few more creatures for us to deal with. As much as I want to say what happens in DementedFX, I will keep my mouth closed and let everyone experience the horrors for themselves. All I can say is that what these guys have created is worth traveling many miles to see. The story of this year’s haunt takes us into a world where some epidemic has consumed many lives and turned them into terrible creatures. You are tasked by Prof. Friden to explore the building and find a cure, but the military is trying to stop him. You must journey through the chaos that has destroyed this once-reputable genetics lab, dodging the many crazy, dangerous beings who call it home. At no point did I ever think twice about what sort of place I was in. Rooms did not switch from dining room to jungle to prison to circus tent. This was, without a doubt, a scary, unethical genetics lab working on strange cross-genetic cloning with humans and animals that has been ravaged by monsters both from the outside world and deep within via their most top-secret experiments. You will get to see the unfinished progress in most scenes, whether it is a mutilated corpse on the table or a half-human baby, half-crab floating in a test tube. The visions that you will see cannot be unseen as you keep reminding yourself you are not actually in a genetics lab accident during the zombie apocalypse. Traveling to as many haunts as I do, it becomes very challenging to scare a guy like me. But when you are walking alongside what you think is nothing and suddenly that nothing grows teeth and tries to swallow you whole, I don’t care who you are, that’s scary! The directors put a lot of time and energy into focusing on timing, the most crucial factor in the art of a good scare. The animatronics are programmed perfectly to hit you and your group at the exact moment to scare everyone. Even the actors do their part in making sure you don’t go too fast or too slow. For a haunt that has both an intro and outro to their story, you may find yourself being held back for a minute just to make sure you get the whole show. The endless amount of bodies all over the lab start to make you queasy, especially the cross species they’ve come up with. After going through DementedFX, I think they may have helped me discover my own phobias, so thanks for that. If these guys can make me think twice about moving forward, then everyone is in for a real treat. Tickets at the door are only $20. I clocked my journey at 16 minutes of non-stop entertainment. With the bar and the music videos to watch, the waiting line isn’t so bad at all. $20 is an average ticket price for a haunt of this size, but you are getting a high-scale, insanely-interactive experience that is not easy to find. Once you get past parking, you are in for a wild evening. If you have been searching for the biggest and best shows the haunt industry has to offer, these guys are well on their way to becoming one of the best in the country. After your visit you will agree with me.